In the fall of his sophomore year, Roger Fu mistakenly walked into the wrong class. What he had thought would be an easy undergraduate course very quickly turned out to be a graduate-level offering in seismology. Fu, who had come to college intending to major in physics, decided to stay on. Just weeks later, he was taking the initiative: setting up seismometers and smashing a metal plate with a sledgehammer to create waves on the Radcliffe Quad en route to discovering a layer of bedrock 10 meters below the surface. The experiments proved formative. "I realized I could use these things that I've been trained to do--math and physics--to figure out something that nobody knew about," he says. "I can actually do something fun with research." Since then, Fu's interests have taken him far afield. A semester in Chile was followed by fieldwork in Argentina, where, Fu says, the Radcliffe Quad experiment was reprised on a much larger scale with the earth's own seismic rumblings stimulating the seismometers instead of a sledgehammer. Now an earth and planetary sciences concentrator with a joint field in astrophysics, Fu wrote his senior thesis on the so-called "exo-planets" (those outside of our own solar system), trying to model the behavior of the massive amounts of water that theoreticians believe may be found on them. But research hasn't been his only service to science. 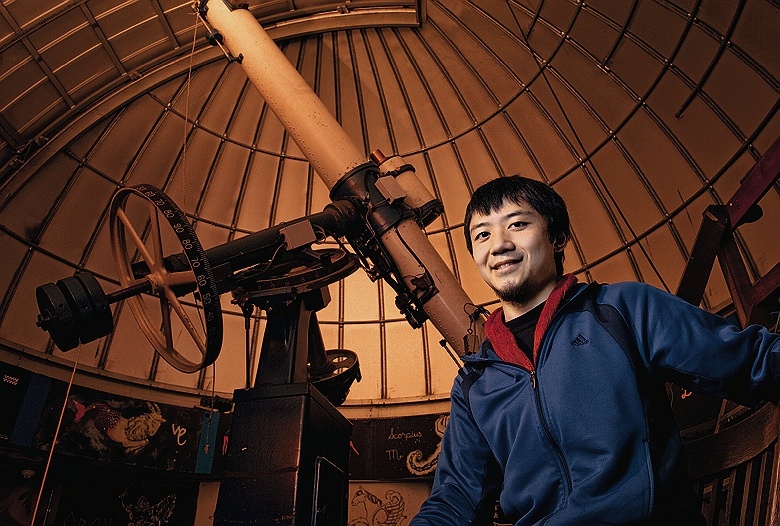 Fu, who received his first telescope as a Christmas present at 11, heads Student Astronomers at Harvard-Radcliffe. In high school, he logged hundreds of hours of community service guiding people's eyes through the sky at Bay Area observatories, having found his own start standing in his front yard, training his small telescope on whatever was shiniest. "One of the first things I saw was Jupiter," he says. "That was sort of an unexpected initiation." Now he routinely trains students on the 10-inch telescope at the Science Center. "It's surprising how fast you can learn the sky if you really try," he says. What's next on the horizon? Fu's ideal scenario would put him back in Chile to collect countryside folk stories about earthquakes--which feeds his interest in mitigating their effects on rural populations in third-world countries. "I would like not to be holed up in an office modeling earthquakes and writing papers," he says. "I'd like to do something that really affects people's lives." English concentrator Marta Figlerowicz is a self-described "book freak." Yet finding just what she wanted to read while growing up in Poland could be tricky. She laughs about the time she discovered her first philosophy text, Heidegger's Being and Time, in the self-help section of the local library. "When I came to Harvard and saw Widener, I was so happy I cried," she recalls. "There were a few books that I was eager to read that I was really frustrated I couldn't get in Poland. I went into Widener and got all of them." Since then she has served as the executive fiction editor of the Harvard Advocate and editor-in-chief of the Harvard Book Review, and has been involved with The Gamut, a poetry magazine. Figlerowicz, who is trilingual, has also emphasized the written and spoken word outside academia: she volunteers at a local community center, teaching English as a second language. "There's something quite difficult about keeping your stance in front of a room of 15 adults...who have had more life experience," she says. "It's taught me a lot in terms of working on my public presence and learning to be a teacher." She also views creative writing as essential for "seeing things you hadn't seen before, and appreciating things you would have taken for granted" while reading others' literature. Having already published articles in two professional journals, Figlerowicz is well on her way to becoming a literary critic. For Prooftexts, she co-wrote a comparative study of two poets: Abraham Sutzkever, a Yiddish modernist, and Cyprian Norwid, a Polish romantic; she had noticed that Sutzkever used images from Norwid, whose work she had loved in high school. For New Literary History, she explored the relationship of Aphra Behn's Oroonoko (a 1688 novel about an enslaved African prince) to theater, to "the relationship between an actor and his/her audience, the degree to which the feelings we attribute to the actor are dependent on our reading (and empathizing with) the reactions provoked." Her thinking represents a departure from the "classical introspective model, which holds that the only way a character can be deeply understood is through voices spelling things out," she says. She has further developed this idea--using "spatial imagination" to see more fluid boundaries around a character and the author's "externalization of character," often drawn through the senses--in her senior thesis on the novels of Thomas Hardy. In one famous scene in Tess of the d'Urbervilles, Tess is carried across a river by her lover. What's described, Figlerowicz says, "is the only insight we ever have into how her partner feels about what's gone on between them. We understand something about the deep psychology of that character," she continues. "But if you look at literary theory, nobody will acknowledge that this could be so powerful because there are no words expressed; it does not seem that anyone is showing us anything directly." In other examples, painful insights come through the "'outskirts' of a character or by his/her meaningful absence." In Return of the Native, she notes, we see the suffering of a stroke victim through a child's perceptions and imitations alone. Figlerowicz feels she has pushed herself at Harvard--she's taken a history of science class, run student magazines, published original work. In all, Harvard has taught her to "go boldly," she adds, "and not let yourself stay in the place where you were most comfortable in the beginning." Tamara Jafar, a varsity field hockey forward, used to joke with her parents that unlike all the Harvard insignia she had culled from playing her sport, she did not have a single item from Baghdad University, her parents' alma mater. Rally for Iraq, an organization that Jafar founded in 2007, has changed that. So far, the apolitical nonprofit has raised $10,000 through the sale of "B.U." items to help support Iraqi college and graduate students studying in the United States. She plans to expand the organization because "the reconstruction of social capital is a long-term project in Iraq"--and higher education plays a key role. Though Jafar grew up in Michigan (her parents moved to the States in the 1980s), her interest in the politics and culture of Iraq and the Middle East sharpened in high school, after 9/11. "I felt as though I was often defensive," she explains, "and wanted to come to terms with my identity as an Arab/Iraqi American." Her studies have also contributed to this end. Her government senior thesis explores the evolution of sectarian identities in Iraq, a topic she researched through interviews with Iraqi expatriates resettled around the world and displaced Iraqi students at the University of Jordan in Amman, where she spent last summer working at the local office of the United Nations Refugee Agency. She concluded that Shia-Arab Iraqis perceive that sectarianism had developed prior to the U.S. war in Iraq and thus sectarian polarization and violence were an unsurprising response to state collapse. Sunni-Arab Iraqis, however, tend to blame the United States and other external forces for the sectarian violence that erupted after the American invasion. As for her rivaling passion, field hockey, which she has played since age 11, Jafar says it is a source of pride (she is one of the few Arab Americans playing in Division 1 athletics) and unparalleled camaraderie. "The atmosphere of unconditional support was one that motivated me in all my endeavors," she says. She was second-leading scorer and an Academic All-American in her senior year, but has plans to play "just for fun here and there" after graduation. It has been difficult to pursue her other loves, singing and writing music, because of her practice schedule, which took up about 30 hours a week in the fall season. But she felt compelled to carve out time to develop Rally for Iraq (www.rallyforiraq.org) because Harvard "reminded me of the tremendous privilege and resources that students in the U.S. have," she says. "I felt the very least I could do was try to find some way to help." She is grateful for the encouragement from friends and roommates, and her mentors among faculty and graduate students, "who have pushed me at times when I wanted to settle or was feeling less than confident in my own abilities." As for the professional world ahead, Jafar knows only that she wants to continue "to be surrounded by passionate, intelligent, and genuine people who care about making a positive impact on the world."